I'm here to warn ya, that ya gotta be very careful about this shot that you got at the title. Because, like the Bible sez, you ain't gonna get a second chance...Well, what ya need is a manager. A manager, listen to me. I know, because I've been in this racket for fifty years...I've seen it all, all of it. Ya know what I've done?...I have done it all...(He holds a bare lightbulb in front of his face) I've got twenty-one stitches over this left eye. I've got thirty-four stitches over this eye. Do ya know that I had my nose busted seventeen times?... 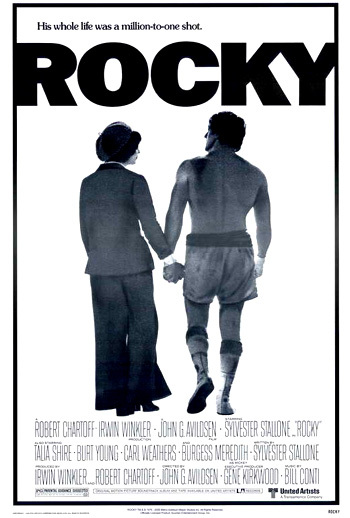 (He glances at Rocky's poster of Rocky Marciano) Ya kinda remind me of the Rock, ya know that?...Ya move like him, ya got heart like he did. I needed your help about ten years ago, right? Ten years ago, ya never helped me none. You didn't care...I asked, but you never heard nothin'. Mickey desperately and urgently begs Rocky, through the closed bathroom door, to be his mentor and live vicariously through the younger boxer: "I'm seventy-six years old..." and then leaves, broken and dejected. As he descends the stairs, he hears Rocky's yelling about how his house stinks, and how his life has been crap, and that he's going to get massacred in the ring by Creed: "What about my prime, Mick? At least you had a prime? I had no prime, I've had nothin'....And you wanna be ringside and see it, do ya? Ya wanna help me out?...Go on, fight the champ. Yeah, I'll fight 'im - (I'll get) my face kicked in." But then Rocky has a change of heart after venting his frustrations and anger. He runs down the street toward Mick, who has reached the end of the block. In a long camera shot, he places his arm around the trainer - they shake hands and are reconciled when Rocky accepts him as his manager. Paulie: What's the story? What's happenin'? Ya really like her? Paulie: I don't see it. What's the attraction? Rocky: I don't know. Fills gaps, I guess. Rocky: I dunno, gaps. She's got gaps, I got gaps. Together, we fill gaps. I dunno. Rocky: Hey! Hey, ya don't talk dirty about your sister. Paulie: Ya screwin' my sister? Rocky: Ya see. That's why I can't connect ya with Gazzo...because you got a big mouth...You just talk too much. You're breakin' the ribs. You do that to Apollo Creed, they'll put us in jail for murder. When he arrives home, Adrian ("lookin' very sharp") in a red coat and white beret is sitting on his front stoop with a surprise present - Butkus with a red ribbon around his neck - "to keep you company when you run." TV reporter: Is this a common training method? I mean, do other fighters pound raw meat? Rocky: No, I think I invented it. The broadcast is witnessed by Creed's trainer Duke in his headquarters. He alerts an engrossed Creed, who is discussing financial figures and closed-circuit advertising and publicity with his public relations team, to the awesome, serious power of the challenger: "Looks like he means business." Paulie: Get outta my house...You're no friend no more...Both of ya get out of my house...Now you're a big-shot fighter on the way up. You don't even throw a crumb to your friend Paulie. When I go and get your meat every morning, you forgot that, and then I even give you my sister too. Paulie: I'm a pig? A pig that seen you had the best. (He smashes a serving set on a side table)...I don't get married because of you. You can't live by yourself. I put you two together and you - don't you forget it. You owe me! You owe me. Adrian: What do I owe you? Paulie: You're supposed to be good to me. Adrian: You want a roommate? Paulie stops by the gym and asks Rocky's permission about advertising and working out "some angle to make some money off your name." Rocky agrees that if Paulie can think up some type of public relations tie-in to make money, he should go ahead: "If you can make money off my name, make it, OK?"